The first time I ever seen a 3D printer was in 2007 in the University of Western Ontario’s Faculty of Engineering. At that time, like the computer of 40 years ago, it was a costly piece of technology limited to academic and research settings. Two years later, the Makerbot Replicator was introduced to the world and the concept of printing 3-dimensional objects became common. 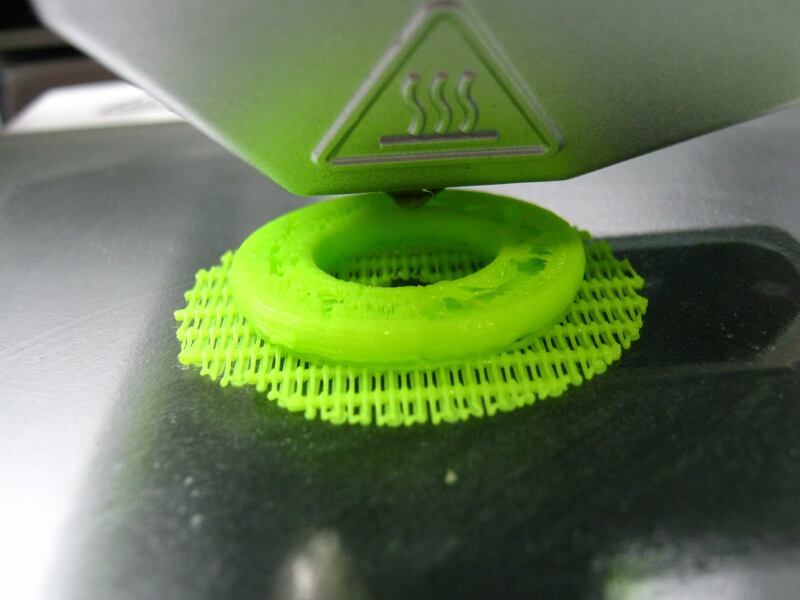 There are many types of 3D printers out there, but the type that comes to most people’s minds involves a process of extruding heated plastic parts and depositing them in layers. This is called Fuzed Deposition Modelling and was developed in the 1980s. In less that 5 years, the Maker movement took off, and public libraries became the new purveyor of the technology, offering 3D printing facilities to their membership for a nominal cost. The first object I ever made was at a Makerspace set up at the Ontario Library Association‘s annual Super Conference in January of 2014. 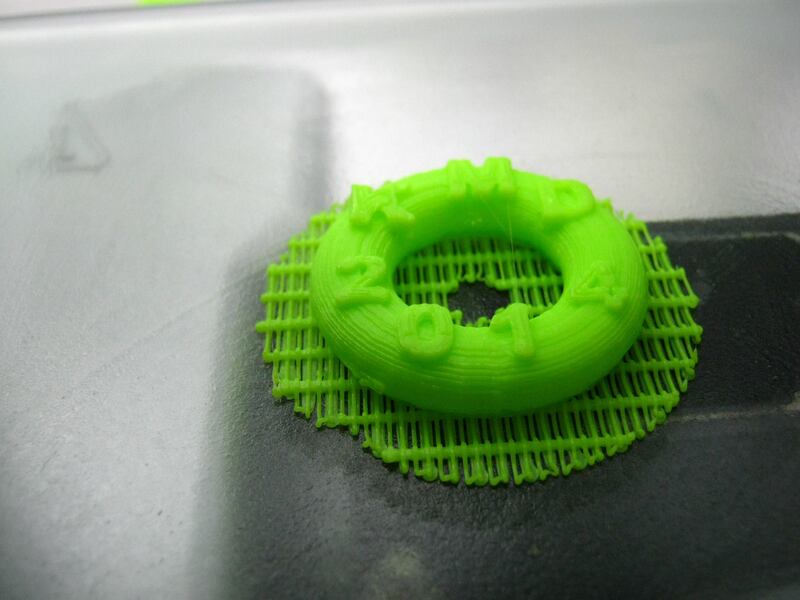 I used Tinkercad (first picture below – note: the colours serve to differentiate the components) to create a small fluroscent green torus ring with my initials and the year on it. 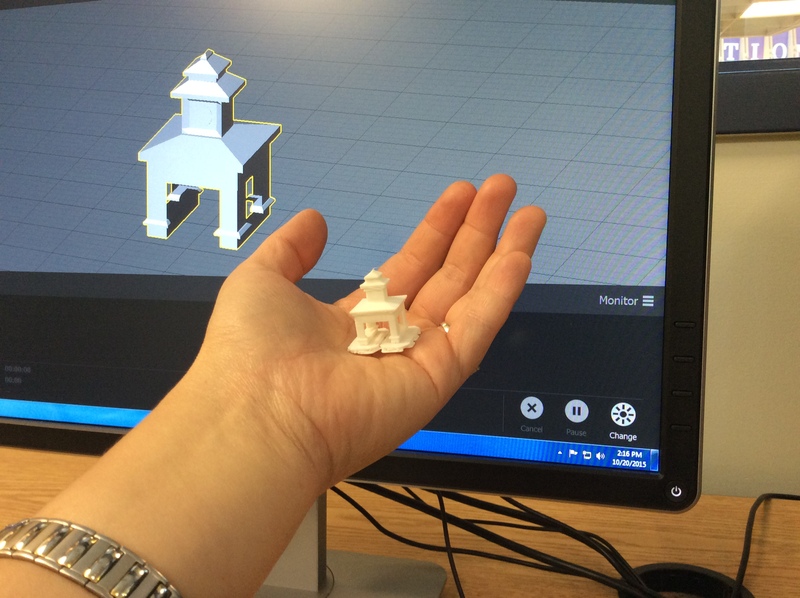 It was printed off on a Cube 3D printer, which is designed for home use. 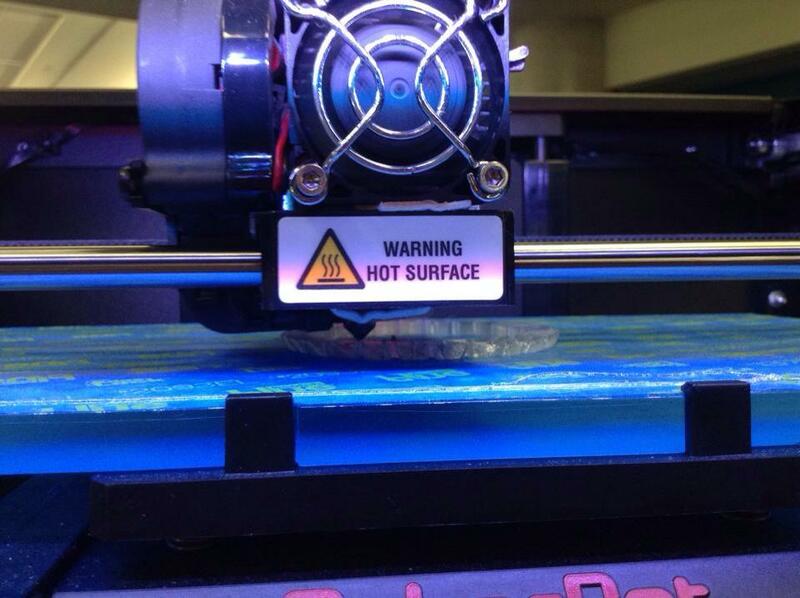 Its filament requires a lower temperature for extrusion compared to other printers in this class, making safer for children to use. 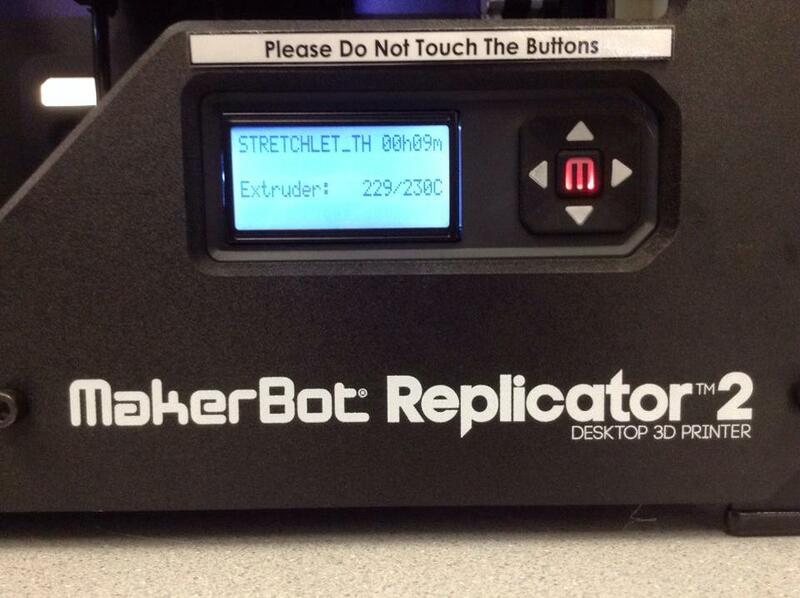 In July of that same year, I had a chance to see the new MakerBot 2.0 set up at the Reference Desk of the Mississauga Public Library. At that time, the library had just invested in the printer and had not yet set up training classes for patrons, but then did have a menu card of around 8 projects downloaded from the Thingiverse for patrons to print. Each object had a nominal fee of set-up, plus printing time and tax. Since it was a quiet weekday morning, I was able to print off a bracelet, a 3-link chain, and the MakerBot signature nut and bolt. 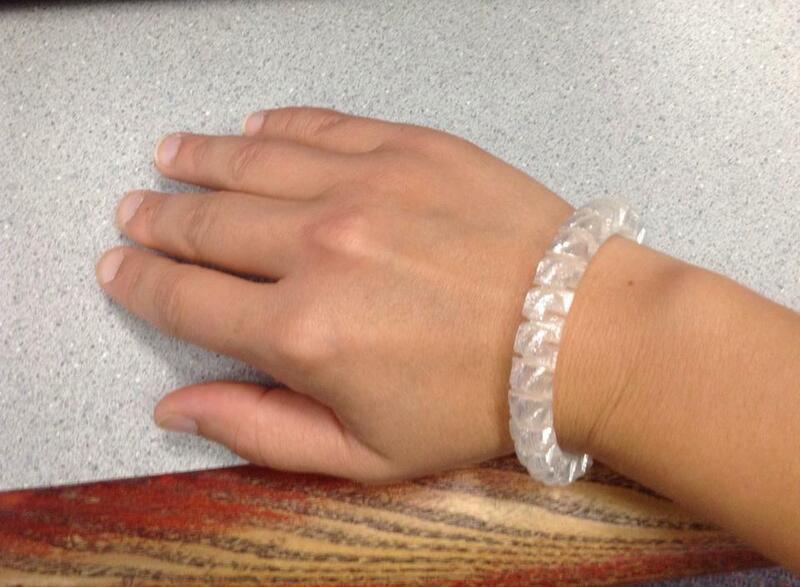 The pictures below are show the bracelet in progress. In October of 2104, I attended a symposium on Creative Making Spaces at the University of Toronto’s iSchool (Faculty of Information, which includes a Library Science program). 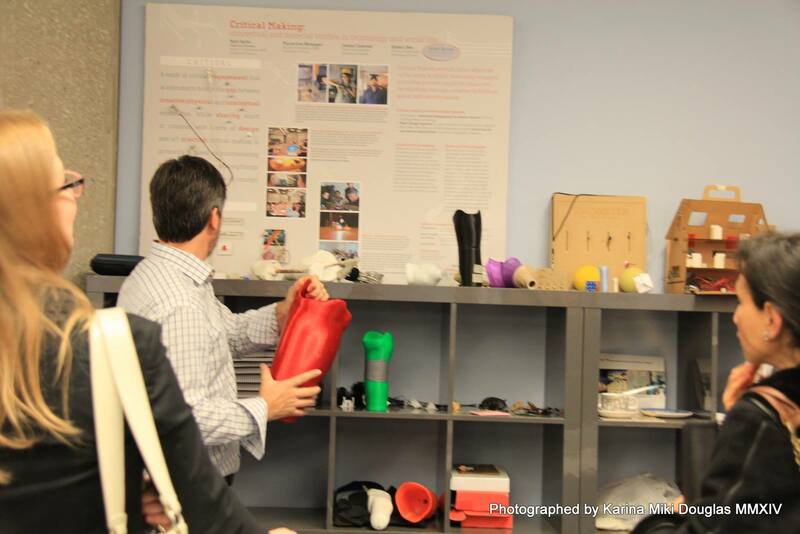 Part of the symposium included a lunch-hour tour of the iSchool’s Critical Making Lab, run by Dr. Matt Ratto. One of the research projects in the lab was using 3D printing technology to make prosthetic limbs for use in developing countries. The objective was to come up with a way that the prosthetics could be developed and produced domestically (i.e. in the country rather than imported), as the demand for prostheses outweighed the number of people who were trained to manufacture them. Additionally, paediatric patients would require them to be changed regularly as they grew. Seeing the potential applications for 3D printing amongst the students and researchers at the university level demonstrated how piquing curiosity at younger age in a school or library setting is beneficial, as the technology advances and demand will increase for components that would be hard to produce by other means. Above: Dr. Ratto holds a 3D printed model of his upper calf below the knee. 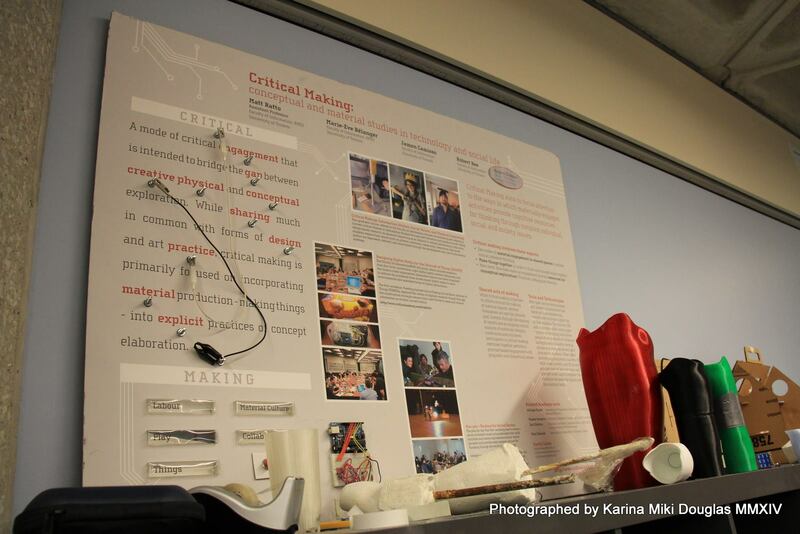 Below: A poster outlines the philosophy of Critical Making. The New Year brought with it talk of our own library acquiring a 3D printer, and after several months spent in researching and ordering, a MakerBot Replicator 5th Generation arrived and was installed by our Systems Administrator. Our CEO decided to premier the printer today (October 22nd, 2015), which meant we need a few examples of printed pieces to show and perhaps a project or two to run. (Public access to the printer will be coming shortly.) Naturally, I jumped on the opportunity to try designing a couple projects to print. As cool as the array is on Thingiverse, I much prefer designing something from scratch. The first thing I did, however, was experiment with an old .ply file (polygon file format) I had from working in ParaView software six years ago. 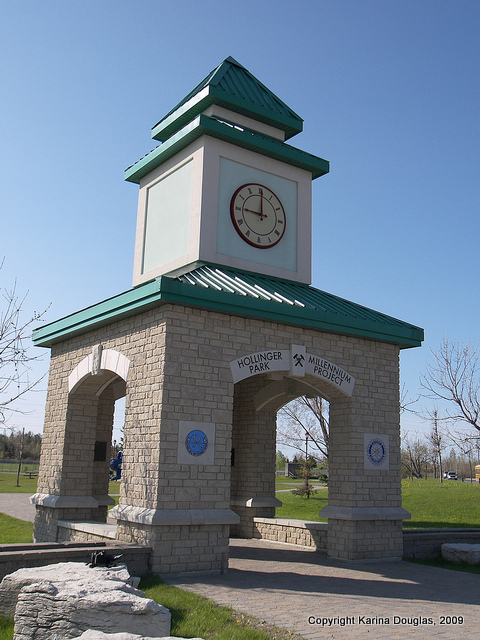 Within the first week of working in Timmins, I took several photographs of a clock in nearby Hollinger Park. The clock is on a sort of contemporary pagoda-style structure about 15 feet tall with arches on all four sides. It was a Millennium project and serves as the entranceway to the park from the intersection of Algonquin Boulevard East and Park Road. As this picture shows, the clock structure has a fairly simple shape structure that makes it good for starting out in 3D illustration. I started by making a model using a free 3D animation software called Blender – I believe the version at the time was Blender 2.49. As basic as this computer assisted drawing of the clock structure looks, it was quite an involved process. (There is a bit of an error on the top right corner of clock frame.) The “grass” below is a tiled jpeg of a patch of dandelions on the horizontal plane. 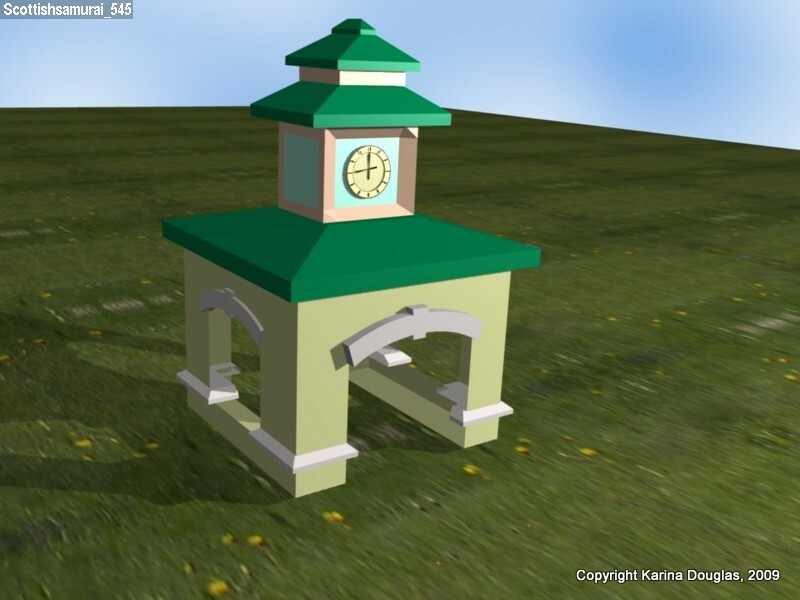 Later on, I experimented with Google SketchUp (now just SketchUp) to try making a model of the clock for Google Earth (the rendering wasn’t well enough for the public view of Google Earth, but I had it on my private profile). The file was then exported into .ply to try viewing in 3D on customized version of ParaView for geological applications: ParaViewGeo… and then it sat untouched on my hard drive for the next six years. I located the old file and found an online converter (http://www.greentoken.de/onlineconv/) that would let me turn it into a .stl (STereoLithography) file, and within a minute I was able to open the file on our MakerBot software. After some time spent scaling the model down to 25mm at the very highest point (to keep the printing task around 20 minutes), I exported it and clicked on “print”. 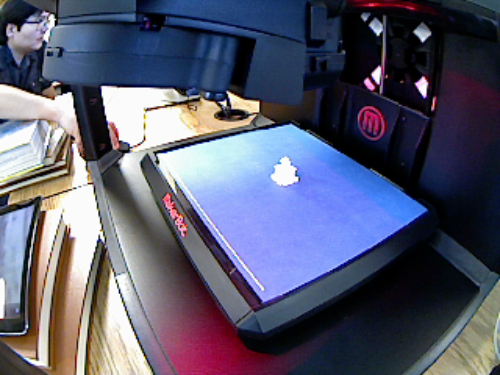 Here is a time lapse I made – 22 minutes of printing time has been compressed into 22 seconds. When the printing job completed, the printer’s built-in task-monitoring camera snaps a photo of your object on the platform for you. Since our operating computer is right next to the printer, I ended up with a side-profile selfie in the picture of my model. 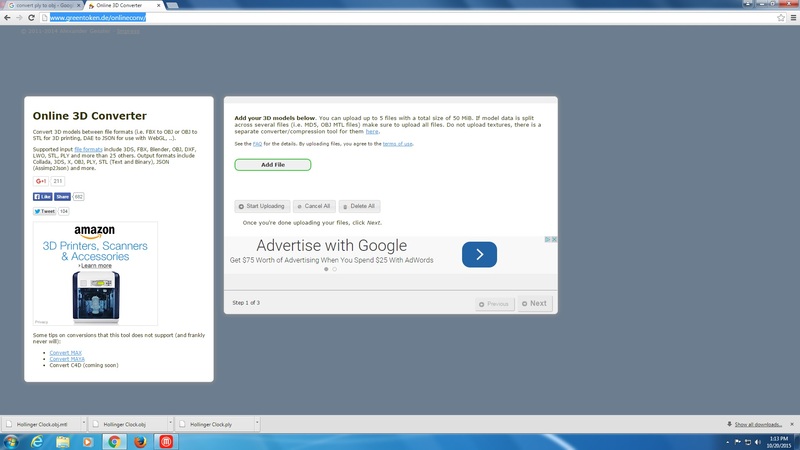 Here is a picture of the completed object with its image file for comparison. P.S. Yes, this is part of what I do as a librarian. Image | This entry was posted in 3D Printing, Technique Experiments and tagged 2015, 3D Printing, Experiment, Technology and Art. Bookmark the permalink.